The Pick: I am an ardent fan of Socrates. He was a legendary bearded intellectual who fought tyranny when it trespassed on democracy. Now, I am not talking about Greek Socrates. 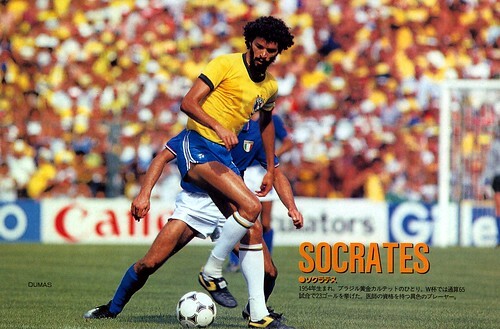 No, I am talking about Brazilian Socrates, the philosopher with his feet. Greek Socrates said “be as you wish to seem”. Brazilian Socrates said “beauty comes first”. Bill & Ted’s Excellent Adventure Socrates didn’t say much. They were all great men with even greater beards. The Flick: Picking who would play Socrates was one of the toughest challenges I have faced thus far on my travels through the Top 100 Soccer Players of All-Time. After all, this movie is going to be legendary (because it is about a legend), so the actor needs to be good. Socrates didn’t just play soccer, he also challenged a military dictatorship and became a medical doctor during his playing days. Plus, that beautiful beard! I’m going with Adrian Grenier.